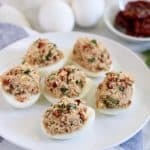 A simple yet elegant side dish that can also made into a light meal. 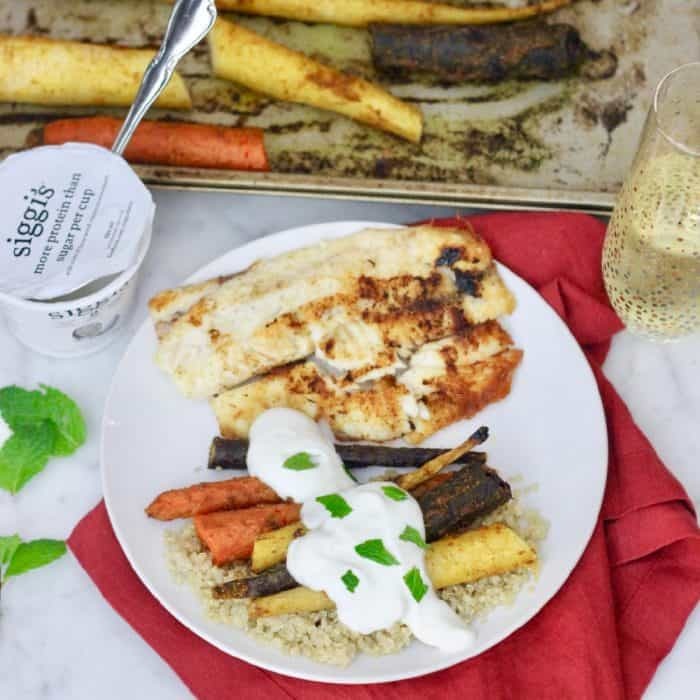 The lemon juice and mint are the perfect companions for siggi’s coconut yogurt to balance out these spiced roasted carrots. Disclosure: This post was sponsored by siggi’s. As always, all opinions are my own, and I only work with brands that align with my values & beliefs. Thank you for supporting the brands that make Living Well Kitchen possible. Those are my kind of recipes. 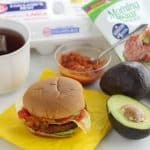 Recipes that don’t require a lot of prep work are lifesavers when you are busy but want to serve nutritious recipes without the fuss. 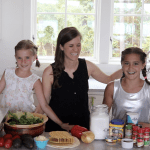 When it comes to entertaining, I am always looking for ways to save a few minutes to keep my stress levels in check. And let’s be honest, I want to look like an entertaining boss without having to spend hours in the kitchen. Spending hours in the kitchen can be lovely, but not when I’m short on time. With the holidays here, whether you like it or not, you are likely going to be entertaining or attending parties where you need to bring something. Lucky for you, I’ve got a simple and gorgeous side dish. 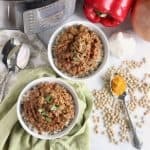 It pairs well with pretty much any protein and is great served with a grain. Plus, it looks elegant yet you only spent a few minutes washing carrots and tossing them with some spices to cook. While your carrots cook, you whisk together the sauce (that has only three ingredients and is to-die-for!) to cover your spicy carrots. Then assemble everything when you’re ready. And seriously, how gorgeous are those colorful carrots?! No worries if you can’t find the multicolored carrots. Orange carrots will work just as well in here. 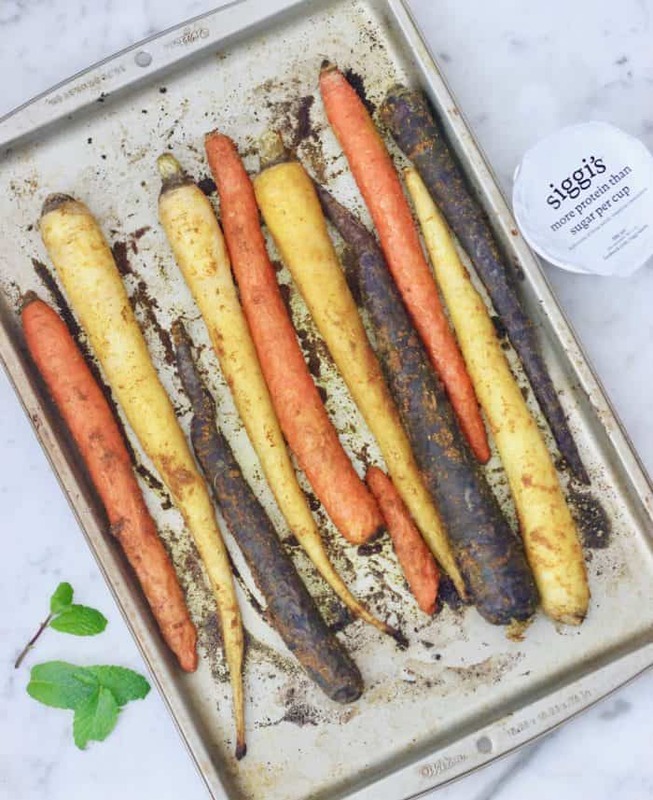 The sweetness of the carrots plus the light sweetness from siggi’s coconut yogurt balances the spicy flavors of cumin, turmeric, and cayenne pepper. 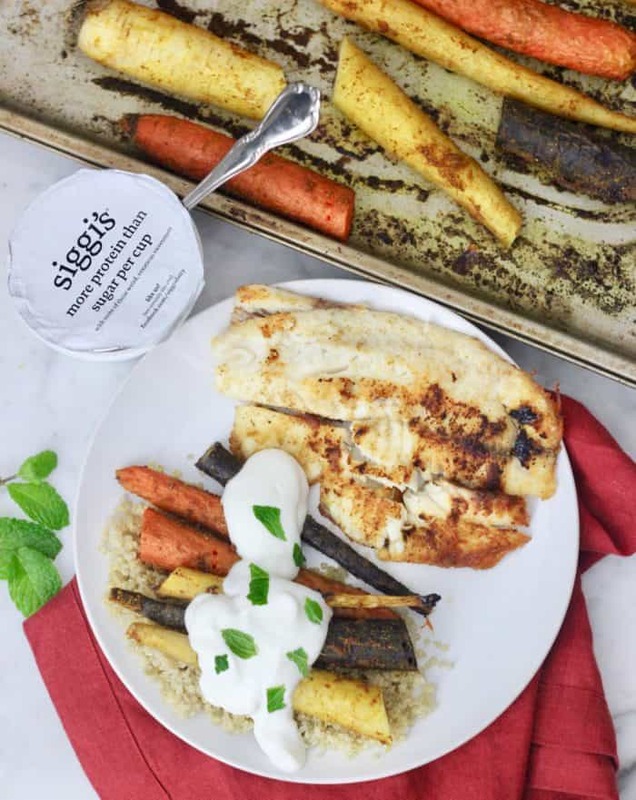 No need to add extra sugar because the siggi’s has the perfect amount. Not too much and not too little. 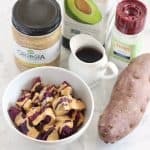 Plus, it adds protein to your side dish. I’ve even enjoyed these carrots over quinoa and fresh spinach for a light meal. Which means you now have a reason to make extra carrots… You can serve this as a side dish for friends and/or family one night, then enjoy the extras the next day for a filling, satisfying, lower in sugar, vegetarian lunch! A simple yet elegant side dish that can also made into a light meal. 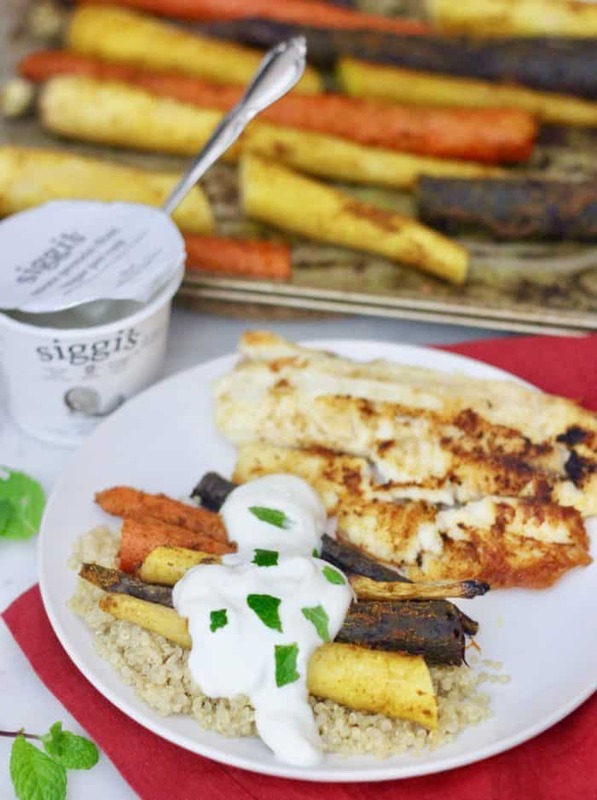 The lemon juice and mint are the perfect companions for siggi's coconut yogurt to balance out these spiced roasted carrots. Preheat oven to 400*F. Line a baking sheet with parchment or foil (to prevent staining your baking sheet yellow). Stir together cumin, garlic powder, coriander, turmeric, cayenne pepper, and salt. Toss together the carrots, olive oil, and spice mixture. Transfer to the baking sheet and bake for 25-35 minutes, stirring halfway through cooking. Meanwhile, stir together siggi's coconut yogurt, lemon juice, and fresh mint. Set aside. When carrots are done, chop and serve with yogurt sauce. Sprinkle with extra fresh mint if desired. Enjoy! *I left the carrots unpeeled for ease, but peeling your carrots can give you a more tender carrot. Either way works! 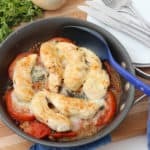 This is a perfect week night side dish! Yum!